… much more than genre fiction. It reminded me of the best of Graham Greene in the way that the novel explores how context and culture impact on crime and justice, and how survival in an intransigently corrupt society involves an existential struggle between integrity and resignation to the inevitable. Blessed are the Dead again features Detective Sergeant Emmanual Cooper and his sidekick Zulu Detective Constable Shabalala out in the backblocks miles from Durban. High up in the Drakensberg Mountains, the land is farmed by people who live in a strict hierarchy based on colour and ethnicity backed up by legalised racial discrimination. The wealthy White English and the dirt poor White Afrikaaners treat each other with mutual disdain but they both consider themselves superior to Jews who have survived the Holocaust and the dispossessed Zulus who live in the kraals and cling to traditional ways. Cooper and Shabalala are sent to sort out the murder of the beautiful Amahle because the local police won’t do it; both the black and white communities have secrets to hide but Chief Matebula wants vengeance because he’s been deprived of the bride price he would have got for his daughter Amahle’s arranged marriage. The cause of death is strange but the local doctor won’t do the post-mortem. It’s odd that Cooper’s boss Van Niekerk wants the matter investigated anyway since black deaths don’t matter much in apartheid South Africa, but he succumbs to political pressure before long and pulls the duo off the case. All this is vaguely reminiscent of another series I quite like (because it’s set in Venice)… Donna Leon’s crime novels feature Commissario Guido Brunetti similarly hamstrung in his investigations because of Venetian corruption, but it’s the attention to black/white relations that sets the Emmanuel Cooper books apart. Emmanuel and Shabalala remained rooted to the spot, stunned by the command and by the faultless Zulu used to issue it. Karin did not speak the “kitchen kaffir” used by whites to give basic orders to their servants. Her inflection and pronunciation were perfect. With eyes closed she’d be mistaken for a native. I featured Malla Nunn in Meet an Aussie Author back in 2014, and I believe she has another novel in the pipeline:). Makes me wonder what a rural Australian detective would have been wearing in the 1950s. More likely to have been khakis than a suit. Doesn’t Doctor Blake (on the ABC) always wear a suit? I’m not sure I’ve had the television on this year except for odd moments of football while I was eating tea. But I do have a Napoleon Bonaparte detective novel with me, over the next few days I’ll see if he wears a suit. It’s partly the era: in the 1950s people did dress more formally in daily life much more often than now. Funny about the suit but yes, I’ve read the book and yes, he wears a suit. It’s a sign of high distinction and sets him better into his position as an official detective for the people (and probably himself). I really enjoyed this book for exactly the reasons you stated Lisa – It’s about the setting more than the crime although the crime part is good. South Africa in 1952 was very much an apartheid state and to have a black/white cop combo would have been tricky to write. Yes, in the apartheid era a person of colour wearing a suit at work would have been a rarity even in the city. It denoted that the person was working in a field that was reserved almost exclusively for whites. Elsewhere in the book Nunn notes the clothing worn by another victim (no spoiler!) – faded blue dungarees – and she calls it the uniform of the labouring classes. The detectives are also able to identify certain people as working for a certain employer because he is ‘generous’ and gives them all the same type of sandshoe for Christmas, distinguishing them from servants who work elsewhere who always go barefoot. Clothing is very much a signal for rank in this book, as it was in that society. Having just watched the 50 yr old film To Sir With Love I understood why Sidney Poitier’s suit stood out so much to the east London class of rough necks. He had so much accompanying integrity with it also. I am not familiar with this series of books. I don’t know if they are my cup of tea but I have read if one wants to become familiar with geography read a crime novel in the place you are interested in. 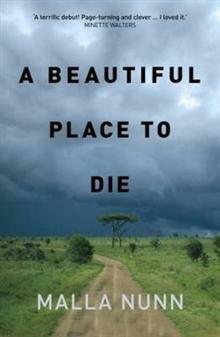 The setting alone sounds different enough to other crime books to be interesting in this genre. I also don’t like crime much but I make an exception for Malla Nunn 😊. I’m not going to read this review as I haven’t read it yet and will get to it. I like to listen to this series on audiobook as it is narrated by Humphrey Bower and he is a wonderful story-teller. I agree about Humphrey Bower, he is one of the best male narrators I’ve ever come across. I remember being really impressed by the way he did all the different accents in A Beautiful Way to Die.